Hi everyone! I was so excited to see that this month's Lacquer Legion theme is "Glam"! When I think of glamour, I think of things that are timeless and never too over the top, so that's what I went with! I started off with three coats of Nicole by OPI Love my Pups, and two coats of OPI Love.Angel.Music.Baby on my ring fingers. I followed with one coat of SV. 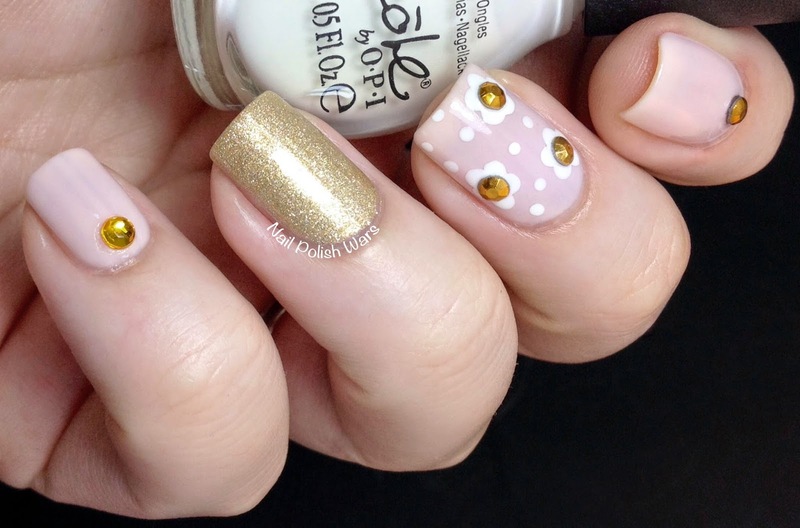 I paired my medium dotting tool with Nicole by OPI Sweet Surrender for the dots and daisy pattern on my middle finger. I followed with one coat of SV. For a little something extra, I added one gold rhinestone to my pinky finger, and beveled gold Winstonia studs to detail my index and middle fingers. I finished with one coat of SV. I just love the end result! It's got some glitz, but isn't too in your face. I had so much fun creating this!! I can't wait to see what next month's theme will be!! It looks good! Love the gold studs. It is an easy mani but trough colors a design is a great one. I absolutely love everything about it! I love how soft this is! And I'm all about studs and rhinestones on nails! This is One Fabulous (glam) Manicure! I now have a lemming for my next one (manicure). :) Love everything about it - color, dainty dots, just right amount of daisies, accent color, studs and their placement. Beautiful photos, very classy.